Washington Monthly | How Do We Encourage Young People To Vote? How Do We Encourage Young People To Vote? Having explored some facts about millennials, I have to say that there is one place where I agree with conventional wisdom: young people are the future of the Democratic Party and it is critical that they become regular voters. In order to ensure that happens, some changes need to be made. When considering data like that, there is something to keep in mind that it obvious – but still needs to be said: age is the one demographic that changes over time. So the actual voters who are represented by the blue line in 1986 are represented by the green line in 2014. 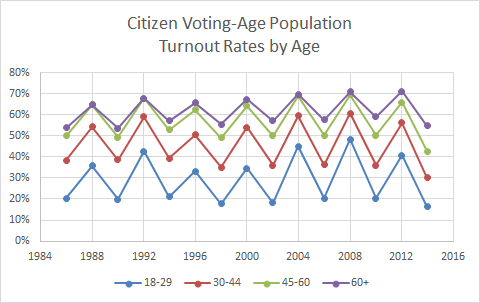 The takeaway from this is not so much about millennials – but about the fact that young people have historically not voted at the same rate as their elders. The other thing to keep in mind is that young people are not solely responsible for the “shellacking” Democrats took in the 2014 midterms. Every voter group saw a drop in turnout that year over previous midterms. So how do we ensure that millennials are engaged both now and in the future? One person who is addressing that issue in ways that deserve more attention is Steve Phillips, author of the book “Brown Is the New White: How the Demographic Revolution Has Created a New American Majority” and the founder of Democracy in Color. In a recent editorial in the New York Times titled, “How to Build a Democratic Majority That Lasts,” Phillips isn’t necessarily talking about millennials. But given the changing demographics he documents, they are clearly the target. He talks about the difference between turnout strategies focused on persuasion vs mobilization. The most critical decision campaigns have to make is how to allocate limited time and money between persuasion and mobilization. Persuasion is aimed at those people who have a history of voting regularly, and it generally takes the form of paid advertising, mainly on television. Mobilization involves the more labor-intensive work of turning out infrequent voters by making phone calls, knocking on doors and driving people to the polls. The civic web leverages face-to-face social networks and emphasizes long-term relationship building. That is the kind of community organizing on which Barack Obama’s campaign was built. The idea of prioritizing voter mobilization strategies has been catching on ever since then – but perhaps not fast enough, which is why these young voices who understand the way the world is changing are so important. It takes courage to break from the status quo of the past, and gray-haired political consultants are likely to be the last ones to adapt. Another way the world is changing is that pen and paper are becoming obsolete. One of the ways we subtly communicate to young people that voting is not relevant is by continuing to rely on paper ballots in a world where “there’s an App for that” is how they live. I suspect that institutionalizing on-line voting is still a long way off. But the sooner we get busy on both developing and promoting it – the faster we’ll convince young people that their voting franchise is relevant in today’s world. You’ll notice that I haven’t said anything yet about the need to highlight the issues that are important to young people. That’s because I think that approach puts the cart before the horse. Politicians and political parties can make all kinds of promises during a campaign. But until young people consistently vote in large numbers (particularly millennials – given the size of their cohort), they won’t see a sustained commitment to their concerns once the election is over and the “prose of governing” begins.